Good breeders are essential to the perpetuation of the breed they work with. The phrases puppy and kitty mill have given breeders a bad name, but the two should not be synonymous with one another. We support adopting shelter pets to give dogs and cats a good home and to save their lives, and spaying and neutering pets. However, we also recognize the need for responsible breeders to provide purebred cats for those who prefer a purebred cat or one that is eligible for show. There is nothing wrong with that, and many people who have purebred cats also have adopted shelter cats. We do ourselves, as well as adopted dogs. But we also love our Minuets and want to share them with the rest of the cat-loving world. Learn about breeding cats here. Whatever you chose to do in finding a new kitten, avoid puppy/kitty mills. These pet factories are not out to produce quality breed animals or even healthy ones. They are after only one thing: money. They are cruel institutions that keep dogs and cats in cages and force them to have litter after litter, with little veterinary care or companionship. They even use non-breed parent animals to produce “purebred” offspring. You could be buying a mutt under the guise of a purebred puppy or kitten. You could also be buying a sick or genetically ill animal. Knowing that, you would be immeasurably better off adopting a shelter pet, which might very well be a rescue from a puppy/kitty mill. 1. Unusually reduced cost of a purebred puppy or kitten. Breeding purebred puppies or kittens is not a cheap enterprise. There is quality food and supplies to provide the parents and newborn kittens/puppies. There are veterinary expenses to ensure the proper health of both the parents and the offspring, and tests done to identify genetic deficiencies or abnormalities. Providing toys and comfortable living quarters is essential for the development of emotionally healthy animals, which is not a cheap expense. Travel costs are involved in both taking the animals to the vet or in transporting the offspring to their new home. Therefor, making money is not likely the primary source of income for a reputable breeder. 2. Pet stores. While not all pet stores get their pets from puppy/kitty mills, it has and still is a widespread problem. Most reputable pet stores promote adopting shelter pets, not selling animals themselves. However, if you are intent on buying a kitten from a pet store, be sure to question them about where they get their kittens and puppies from. Be especially cautious of pet stores in the Midwest, particularly Missouri and Illinois, which are the biggest violators of this policy. 3. If the parents of the young pet are not available or the breeder doesn’t let you see them. Most reputable breeders have their own breeding parents and are very proud of them. They willingly boast about them and have pictures of them. If you are in the area, they will no doubt let you see them. Some breeders lease studs, and this is acceptable. If that is the case, the breeder should be able to direct you to the owner of the stud to show him. However, puppy/kitty mills don’t want you to see the condition of their operation or their parents. In fact, those parents may not even be the same breed you are hoping to get. In other instances, the puppy/kitty mill may just be the broker for another shady organization. 4. The owner of a puppy/kitty mill doesn’t want you to come by their operation. If the breeder you are interested in doesn’t want you to visit the place where he runs his operation, you should be seeing red flags. There is no reason why a breeder should not invite you to his operation if he is a reputable breeder. 5. An operation offering many diverse breeds. A good breeder is interested in perpetuating the quality of the standards set in one breed. If you find a breeder who deals in multiple breeds, you are likely dealing with a puppy/kitty mill. Note: A good breeder may also breed within its breed group. For instance, the Persian breed group, which consists of Persians, Himalayans, and Exotic Shorthairs. In the case of Minuets, breeders sometimes work with Munchkins and the Persian breed group because those are the cat breeds acceptable for creating Minuets. 6. An operation offering both puppies and kittens. Like the previous caveat, you should be extremely wary of a breeder who dabbles in both puppies and kittens, especially if those come in diverse breeds. This is not always the case and you shouldn’t base your assumption on this alone, but this caveat, in conjunction with other warnings on this list, should make you wary of the breeder. 7. A large number of offspring available. A good breeder can be recognized by having a waiting list. This is because they aren’t breeding several animals at once. They have a limited number of parents and pace their breeding apart to allow the parents to recover from a pregnancy and raising a litter. A good breeder’s main concern is the health of their animals, both adults and young. They limit themselves to only the number of animals they can adequately care for and keep happy and socialized. If a breeder has too many young available, be wary of proceeding with them. 8. No vaccinations offered or recorded. If a breeder doesn’t vaccinate his puppies or kittens, you are definitely dealing with a puppy/kitty mill. A breeder should not only have his adult parents vaccinated, but the young he is trying to sell. If he says he does, make sure you see records. Call the veterinary on record and check to ensure that the breeder is a client of theirs and that they see his litters. 9. Cleanliness of the offspring. If you have an opportunity to visit a breeder’s place, take care to judge the cleanliness of the operation. If you are like other people who only have contact with a breeder from a great distance away via email, ask to see pictures of their litters. Ask for pictures of their litters’ environment. Pay particular attention to the cleanliness of the animals. Examine the background pictures they post on social media. 10. Contract protecting both you, the breeder, and the animal. A good breeder will provide a sales contract for your new pet. This contract should include conditions of spaying/neutering, health certificates, breed papers (or how to register your new pet), and an arrangement to return the pet if it doesn’t work out between you and the animal. 11. Allowing the young to go home with you too early. The earliest age a puppy should leave its mother is 8 weeks old, and for a kitten, it’s 12 weeks old. Many reputable breeders wait even longer to ensure that the puppy or kitten is up to date on its vaccinations, is fully weaned, and is on its way to being adequately socialized. Owners of puppy/kitty mills want to unload their animals early so they don’t waste any more money on them than they have to. 12. Not registering litters. While this may not be an indication of a puppy/kitty mill, a breeder that does not offer to register their litters is a strong indication that the breeder is using parent cats that his is not allowed to use for breeding. This is because litters from a pairing of parents bought without breeding rights cannot be registered with any association. These breeders are in violation of association rules and should not be trusted. Now that you know what to watch out for to avoid dealing with a disreputable breeder, you should know what to look for in finding a GOOD one. While someone selling cats may not fall within the parameters of a puppy/kitty mill, they may not be the most diligent of breeders either. A GOOD breeder has the health and happiness of their cats in mind, as well as an interest in perpetuating the standards of the breed. In order to do that, they are invested in whoever purchases a kitten from them. Their interaction with you as a new cat owner does not end with handing off the kitten to you. 4. The reputable breeder carefully interviews prospective owners and has specific requirements to be met, i.e. ; cat/kitten is to be altered (if the breeder is not already practicing early altering), not allowed to roam outdoors, etc. 5. The reputable breeder is willing and able to educate the novice. He happily answers questions regarding the breed and his/her breeding program. 7. 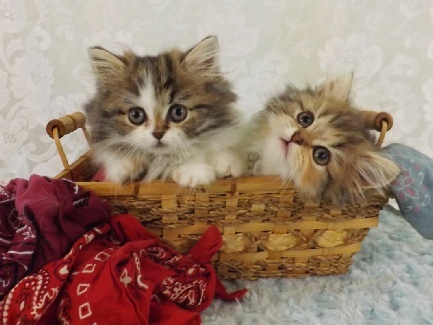 The reputable breeder does not have more cats/kittens than he is able to keep clean, healthy, and socialized. 9. The reputable breeder is concerned with temperament as well as the health of his cats/kittens. 10. 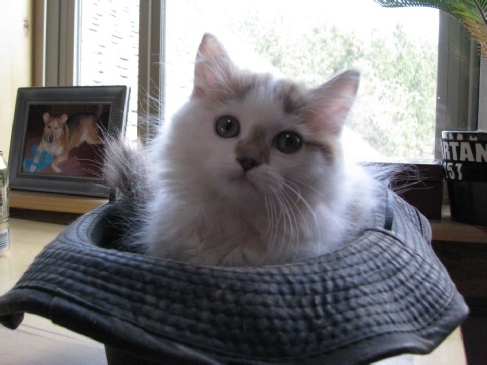 The reputable breeder makes himself available for advice and help to other breeders, and throughout the life of the cats/kittens he has placed with individuals. If you are interested in becoming a breeder of Minuets, do not undertake the endeavor without finding a responsible breeder as a mentor. Should you choose Tiny Lions Napoleons to be that mentor, don’t hesitate to contact us in the following manner. In the meantime, check out these facts about breeding cats here. I’ve had the pleasure of dealing with a few Minuet breeders who are truly dedicated to perpetuating the quality of the breed. These are the breeders I would recommend to contact if you are looking for a Minuet kitten if you can’t find one with us. Note: Just because a breeder is not listed here does not mean it is a bad breeder.